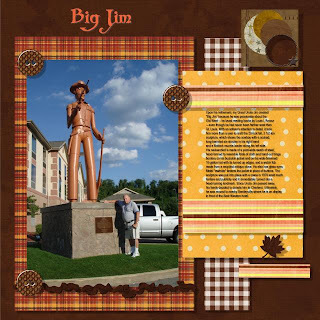 Journaling: Upon his retirement, my Great Uncle Jim created "Big Jim" because he was passionate about the Old West -- he loved reading books by Louis L'Amour -- even though he had never been farther west than St. Louis. With an artisan's attention to detail, it took him more than a year to craft the 20-foot tall, 3 1/2-ton sculpture, which shows the cowboy with a cocked, long-barreled six-shooter in his right hand and a flintlock muzzle-loader along his left side. His neckerchief is made of a yard-wide swath of steel, hand-formed to resemble folds of cloth and hand-cut fringe borders on his buckskin jacket and on his wide-brimmed 10-gallon hat with its turned up edges, and a watch fob made from a recycled antique stove. He also has glass eyes. Metal "rawhide" fastens the jacket in place of buttons. The sculpture was put into place with a crane in 1978 amid much fanfare and publicity and it immediately turned into a head-turning landmark. Since Uncle Jim passed away, his family decided to donate him to Charleroi. Ultimately, he was moved to nearby Bentleyville where he is on display in front of the Best Western hotel.